If you run a business that stores confidential customer files or sensitive business documents you probably shouldn’t trust those files to a run-of-the-mill virus scan program you purchased at a local retailer. Sure most virus scan programs do a great job of protecting your personal PC, tablet, or smartphone, however they lack the file server, endpoint, and remote management solutions offered by Enterprise level virus scan programs. In a touchy economy we recognize the need to save money and therefore we suggest checking out our list and then comparing it to, best antivirus, a website that extensively reviews antivirus programs to ensure that all of their major components are fully vetted for users. Avast! offers a protection suite that provides not one piece of software but instead multiple parts. The basic suite offers endpoint protection, file server protection and remove management. Avast! pairs that protection with email server integration with firewall support and anti-spam measures. Administrators can easily create installation packages and push those packages to client systems on the network. Avast! also allows for end users to check on their protection level, run scans directly from local machines, and perform basic maintenance for the software. F-Secure Business Suite offers a small footprint for business owners who require top-notch security but without all the bells and whistles of some other programs. The program offers the ability to easily build and deploy packages to AD or IP-based systems and boasts of a small footprint on the endpoint. Despite a small foot print users still receive browsing protection, anti-malware, rootkit detection, IPD, and email and web filtering. The end user just like Avast! is able to view statistics on their local machine by way of the programs client software. Panda is yet another endpoint discovery and deployment tool but it also offers some nice additional features. Panda AdminSecure pffers a self-diagnosis system to allow administrators to check whether the system is functioning properly. The software also provides activity monitoring and reporting tools that can provide details about how the system is being handled. The GUI is very thin but the tools for monitoring network health are not lacking. If you run a network with Windows, Mac OS X, iOS, and Android devices all intermingled you should check out GFI VIPRE Antivirus Business. This program supports all of the OS’ just listed with a fairly sparse management console. The system features a small footprint but provides administrators with the tools to check end user checks and admin access. Webroot SecureAnywhere Business – Endpoint Protection is the only choice we made that has a cloud-based configuration as its only base of operation. The dashboard for this antivirus business solution is one of the best in the industry, providing administrators with quick endpoint details checks. The client for Webroot installs in seconds and scans systems in less than two minutes. Webroot also claims to run without conflicts next to any other antivirus measures already installed on a company’s machines. Limited internet bandwidth and other issues are the only concern with this software which is why we recommend using it alongside another solution. 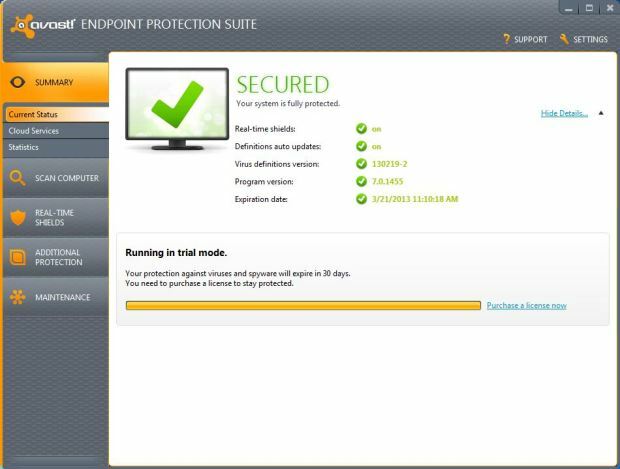 Those are some of the best enterprise level antivirus solutions based on a low-cost of entry. Of course every business owner needs to evaluate their own business needs to determine what type of virus protection they require.